Did February feel extra long to you? It did for me. Possibly because I’m not eating everything I crave. For those of you that don’t know, Red is getting healthy. I wrote about my “Blog Bulge” last week and you can find it “here“. I thought I should reassure you that RCD is not turning into a food blog. healthier foods, and more exercise. I eat so many veggies now! I’ve lost a total of 4 lbs. since I began almost 2 weeks ago. I have noticed the weight is not coming off as easily as it did even 2 years ago. I have also learned that sometimes those hunger pains can wait a little. I think it’s good for your body to let those go and don’t pacify them so quickly. I sound like I have this perfectly under control, don’t I? It’s a constant struggle I won’t lie. Not sure why, even when I’m not watching what I eat I never order one. Actually, the last one I had was after a NASCAR race years ago with my hubby and Sister. These days I try to avoid Mc Donald’s, except I do occasionally get their Egg Mc Muffin. It only has 300 calories and lots of protein. As a little girl in the 70′s going to Mc Donald’s was a HUGE treat. I loved my “haberger frech fri coke” and my Mom still reminds me of how cute it was when I would order the same thing every single time. 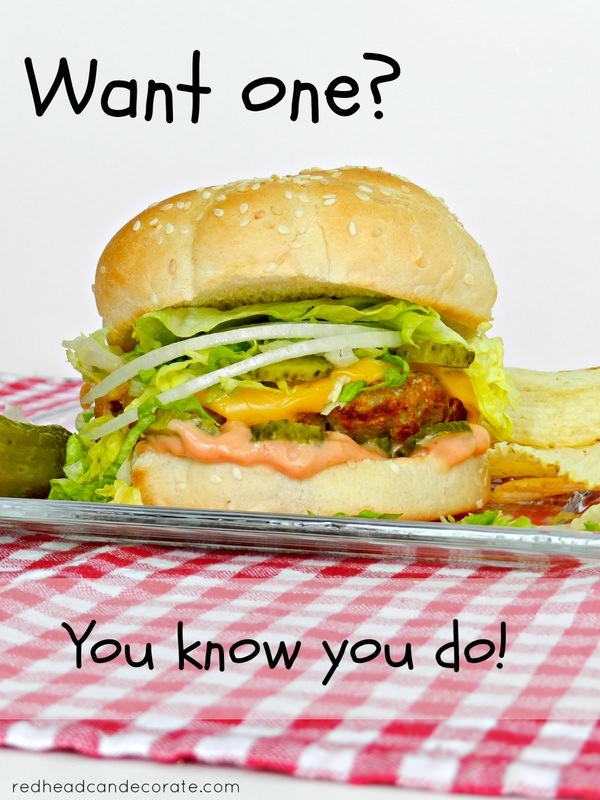 So, back to the story…there I was dreaming of those cheesy, salty, lovely double patties and I thought about what I could make at home that would satisfy this craving with out going overboard with calories. This is a perfect lunch for me. It would be even better for dinner. I’m getting my protein, my calcium, even some veggies. The chips (12) are an added 140 calories if you get Ruffles reduced fat which are my favorite. Still, even with the chips, 440 calories for lunch/dinner is pretty good. If you want less, just skip the chips. 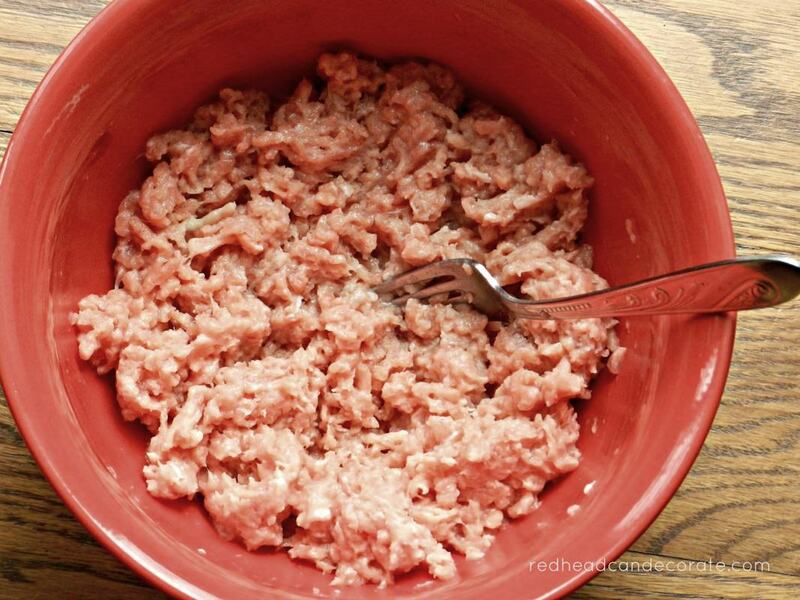 Mix all ground chicken, egg substitute, bread crumbs, S&P in medium bowl. Split in 1/2 as best you can. Form 3 patties from each of those 1/2′s so you have a total of 6 patties. 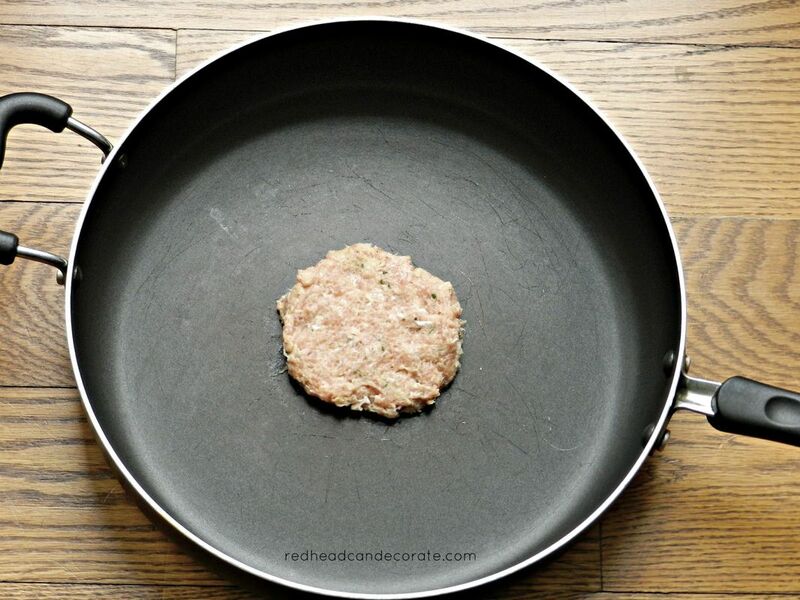 Fry on a non stick pan with no oil or anything. Takes about 15 minutes total until it’s brown and a little crispy on the edges. Make sure the meat is no longer pink in the middle. 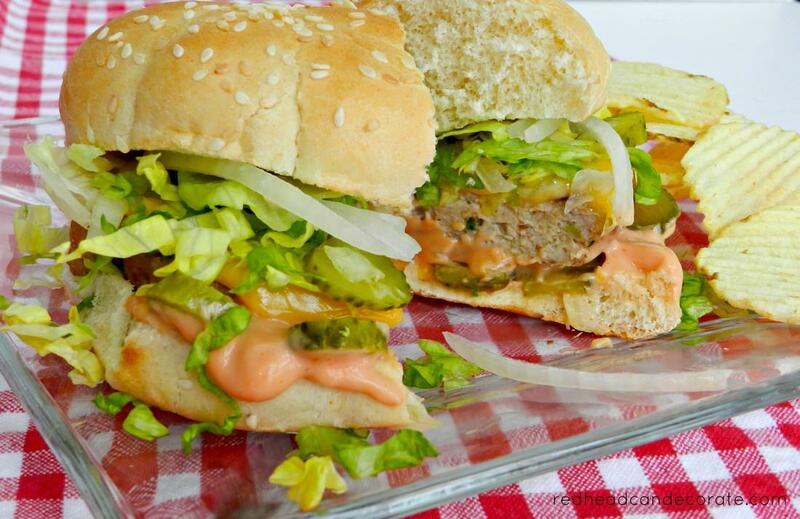 Do not flatten patties when cooking because you will lose tenderness. 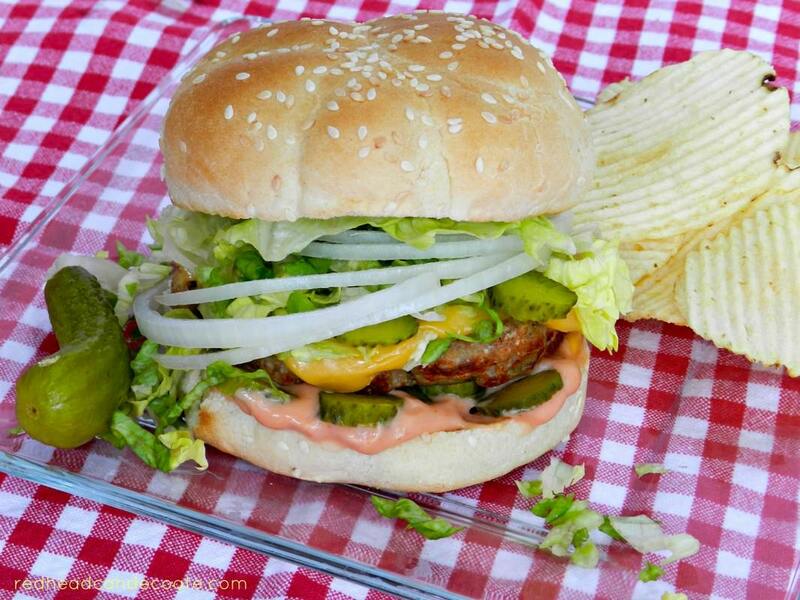 * Tip: wetting your hands a little will help when forming your patty so it doesn’t stick to your hand. This goes for meatballs too. Daphne, my oldest is a burger QUEEN. Burgers are her favorite. Remember that guy from Popeye? He scarfed down burgers… That’s Daphne if I let her. 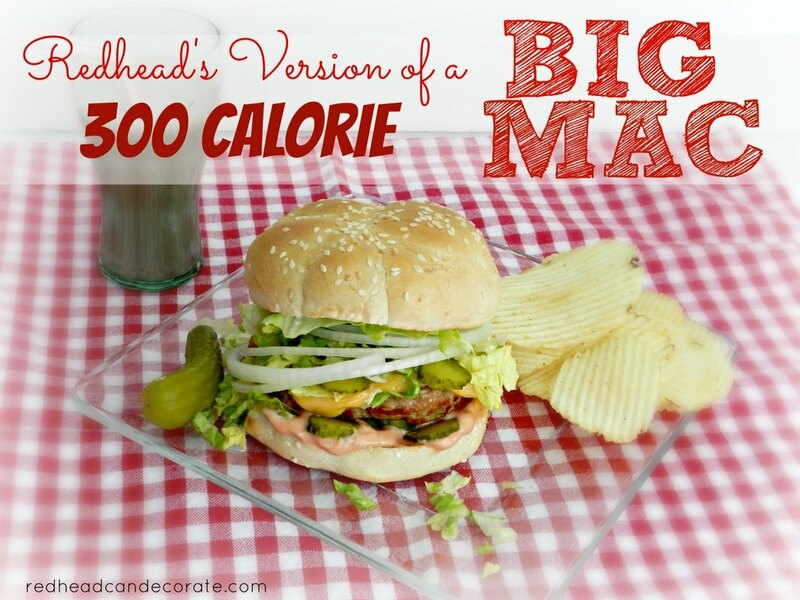 My low calorie version doesn’t taste exactly the same as a real Big Mac, but I know you will enjoy it. I hope you try my recipe. Stop by next Wednesday for my second “link party”. 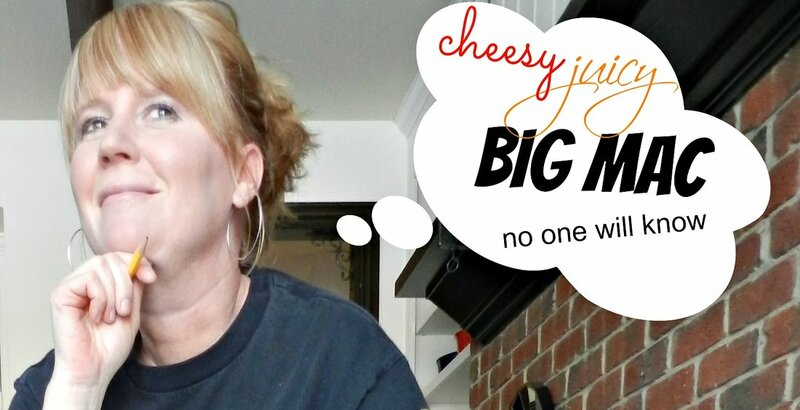 I have plenty of friends I’m bringing a long with me to share healthy tips, stories, and recipes to help us all reach our goal of getting rid of our ”Blog Bulge” and getting healthy. You don’t need a blog to join the party. Oh yes I do want one!! Thanks Julie!